Prime Minister Narendra Modi believes that Swachhagrahi is at the at the core of a Shreshtha Bharat. 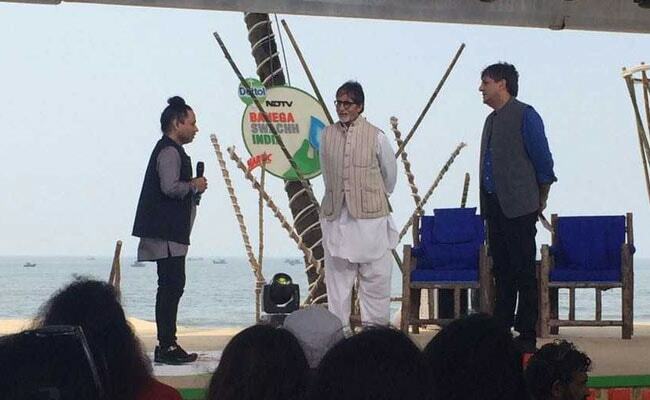 Kailash Kher is back at the Banega Swachh India cleanathon to mesmerise with his powerful vocals. He too sings a rendition of the popular bhajan Vaishnav Jan To and a line from the Swachh Bharat Abhiyan theme song. Punjab Chief Minister Captain Amarinder Singh says that Punjab's colleges and universities were working hard to find solution to the crop burning problem. The issue is economic in nature and poor farmers who are already in debt are not worried about finding alternatives to stubble burning. The CM also said that Punjab will become open defecation free by December 2017 as the state is building both toilets and bathrooms, and giving Rs 15,000 as subsidy to households. 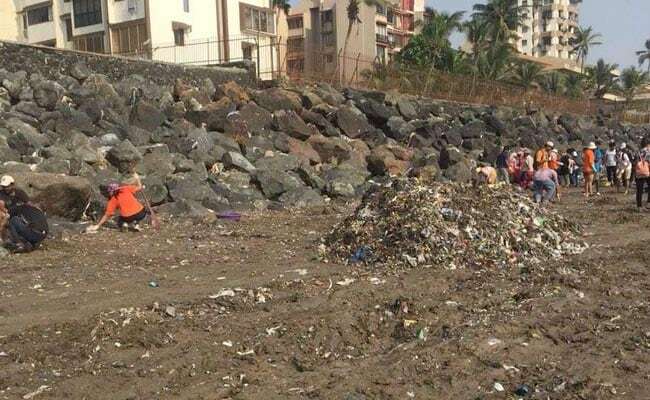 Afroz Shah, one of the architects of Versova beach cleanup, says that his complaint on Versova was to himself and he had taken it upon himself to clean the beach. In the last two years, Mr Shah and his team of volunteers have managed to pluck out 7,800 tonnes of garbage from the beach premises. The United Nations has termed Mr Shah's initiative as the biggest beach cleanup in history, says Mr Shah. 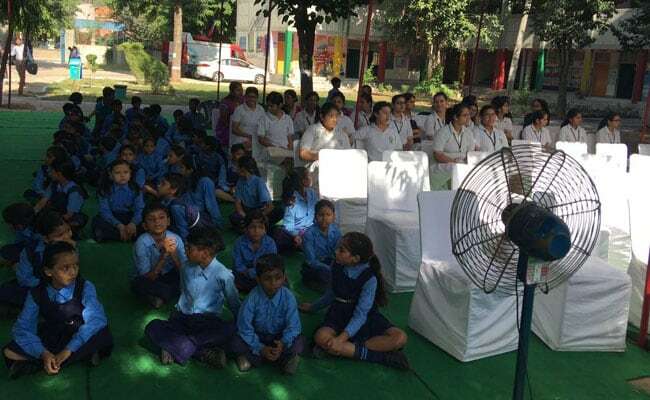 Students from Delhi Public School at RK Puram are ready to spread the message of Swachhta in government schools. As tribute to Bapu, let's renew our pledge of #SwacchtaHiSeva and join PM @narendramodi ji in building a #SwacchBharat of Bapu's dreams. 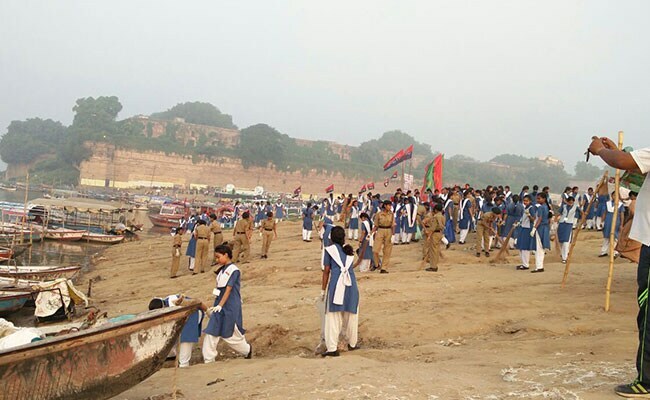 The Banega Swachh India 12-hour cleanathon at Allahabad saw the participation of several volunteers at the Triveni Sangam banks, who came forward to participate in cleanliness activities. Captain Virat Kohli, Coach Ravi Shartri and the team urge people to make India cleaner and better place to live in. Aishwarya Rai Bachchan is the latest celebrity to lend her support to Prime Minister Narendra Modi's Swachhata Hi Seva mission, she urged everyone to do their best to fulfill Gandhi's dream of Swachh Bharat. Prime Minister Narendra Modi lost no time to laud Anushka's efforts. Actor Anushka Sharma, who was invited by the Prime Minister to join the Swachhta Hi Seva initiative, participated in a cleanliness drive on Friday in Mumbai's Versova beach. The football team's efforts draw appreciation from Prime Minister himself. The coach joins the players in their clean up efforts. Minister of State for Housing and Urban Affairs, Hardeep Singh Puri inspects Green Waste Management Centre during the Shramdaan event. I extend my full support to our hon. Prime Minister @narendramodi ji's #SwachhataHiSeva mission. Cleanliness is godliness. 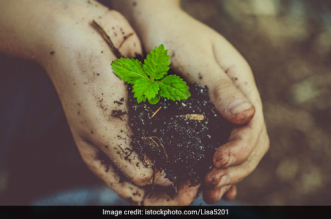 Union Minister for Agriculture, Radha Mohan Singh partook in the "Swachhata Hi Seva" campaign by engaging in a cleanliness and tree planting drive at his constituency Champaran in Bihar. Dr Mahesh Sharma, Minister of State for Culture participated in a cleanliness drive in Noida, as a part of the "Swachhata Hi Seva" campaign. 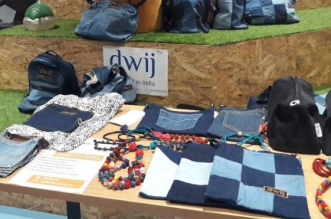 Wishing Prime Minister Narendra Modi on his birthday, Union Minister for Drinking Water and Sanitation Uma Bharti came up with the innovative slogan on gifting a cleaner India to the Prime Minister as a birthday gift. Prime Minister Narendra Modi thanked Prakash Javadekar for his birthday wishes and praised his participation in the Banganga Lake cleaning, calling it a wonderful effort. On the occasion of Prime Minister Narendra Modi's birthday on September 17, Union Minister for Human Resource Development, Prakash Javadekar took part in a "Swachhata Hi Seva" event at Banganga Lake in Mumbai. Mr Javadekar cleaned up trash from the banks of the lake. The Prime Minister also thanked all those who took part in various cleanliness activities across India during the "Swachhata Hi Seva" movement. 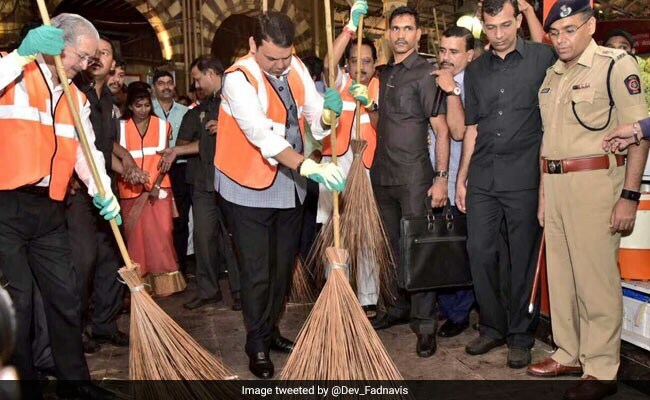 Several noted politicians, including Home Minister Rajnath Singh and Maharashtra Chief Minister Devendra Fadnavis engaged in cleanliness activities to mark the launch of the campaign. Happy to see strong enthusiasm towards #SwachhataHiSeva movement. I congratulate all those taking part in various cleanliness initiatives. Prime Minister Narendra Modi thanked President Ram Nath Kovind for launching the "Swachhata Hi Seva" movement at Kanpur. President Kovind: We have to change age-old habits to ensure cleanliness and freedom from open defecation. 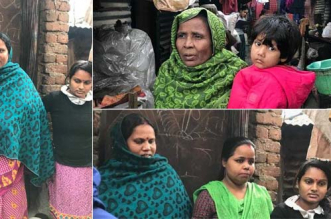 Several instances of girls refusing to marry in households without toilets have come as a bold step towards a sanitation revolution. I want the whole nation to contribute towards building a new India. We need to have a sense of nation-building by building toilets. 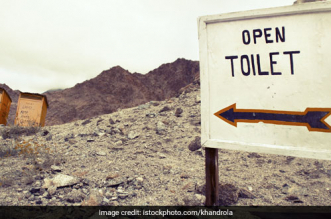 Sikkim is one such state where eradication of open defecation has been successful. This mission will change the future of the country and we must come together to build a new nation. Gujarat Chief Minister Vijay Rupani took part in a cleanliness programme to mark the launch of the "Swachhata Hi Seva" campaign. President Kovind says that he has arrived home. 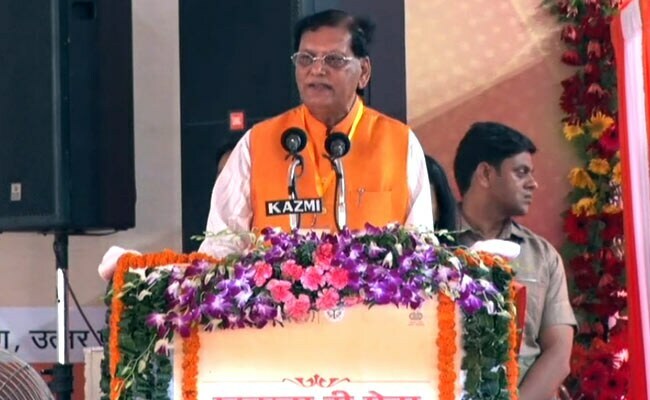 Kanpur has been the home of historic struggles and today is fighting against open defecation, the foundation for which was laid by Prime Minister Narendra Modi. 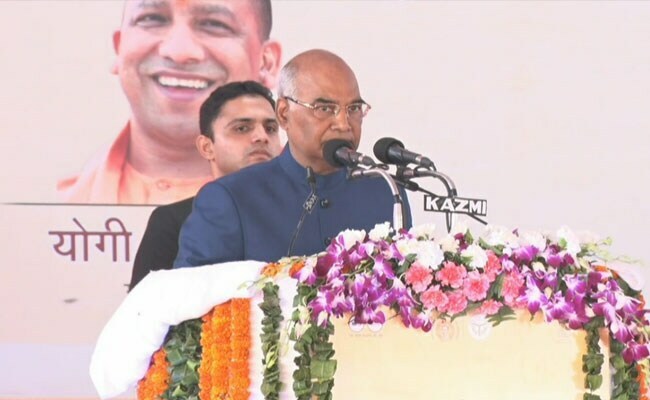 The President congratulates every resident of the Ishwari Ganj village for successfully eradicating open defecation from the village. 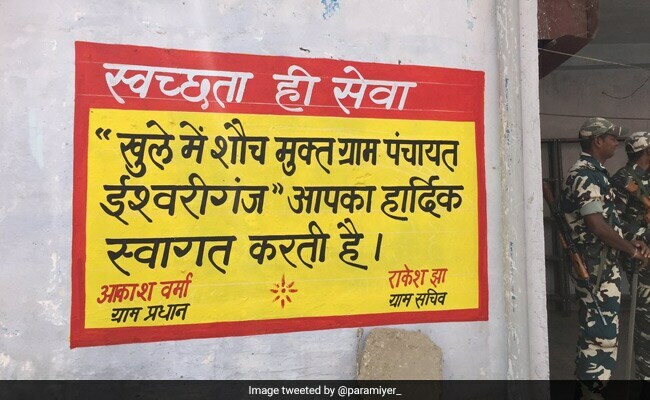 Swachhta is no longer just the responsibility of government departments or officials. Mahatma Gandhi had said this decades back. The key to ensuring Swachhta would be sustain safe sanitation practices. President Ram Nath Kovind takes a pledge to maintain cleanliness along with everyone present in the event. Uttar Pradesh Governor Ram Naik said that he has entered the Parliament five times contesting from Mumbai's jhuggis and jhopdis. Uttar Pradesh has more land than Mumbai does. Even in small rooms in Mumbai, there are toilets. There must be a willingness from within to make toilets. Toilets are a must in the house, even if there are no temples. When the biggest state becomes open defecation free, the country will also become open defecation free. 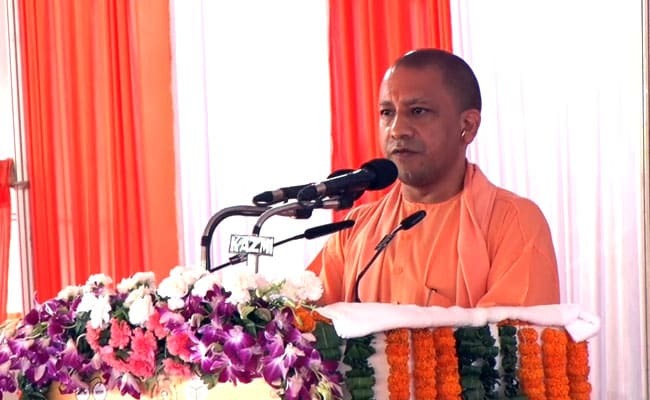 Uttar Pradesh CM: By 2018, 10 lakh people will be given new houses under Pradhan Mantri Awaas Yojana and along with the houses, a toilet will be provided for each household. Rs 12,000 crore will be spent to improve rural sanitation. Rs 10,000 crore will be spend for urban sanitation. 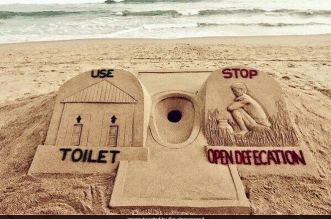 Adoption of Swachh Bharat a must if we want to improve health and sanitation conditions. More than 1,600 villages across Ganga banks have been declared ODF. 1.5 crore toilets to be built by October 2018 in the state. Uttar Pradesh Chief Minister Yogi Adityanath welcomes President Ram Nath Kovind on behalf of the residents of Uttar Pradesh. The UP CM says that when the Swachh Bharat Abhiyan had begun, many people questioned the necessity of it. The mission has now become a people's movement. The Chief Minister also states that over 10 lakh toilets have been built in the past 6 months and 15,000 toilets are being built every day. 10,000 villages and 4 districts in the state have become ODF. The state's aim is to build 78 lakh toilets to make Uttar Pradesh open defecation free by October 2018. Bindeshwar Pathak, founder of Sulabh International talks about the importance of technology in combating open defecation. Mr Pathak says that after Mahatma Gandhi, sanitation has been given importance by Prime Minister Narendra Modi. He read out a few lines from a letter written to him by the Prime Minister, in which he praised Mr Pathak's passion and commitment towards building a Swachh Bharat. Rajyavardhan Singh Rathore, Minister of State for Youth and Sports Affairs took to Twitter to pledge for his fight against open defecation. 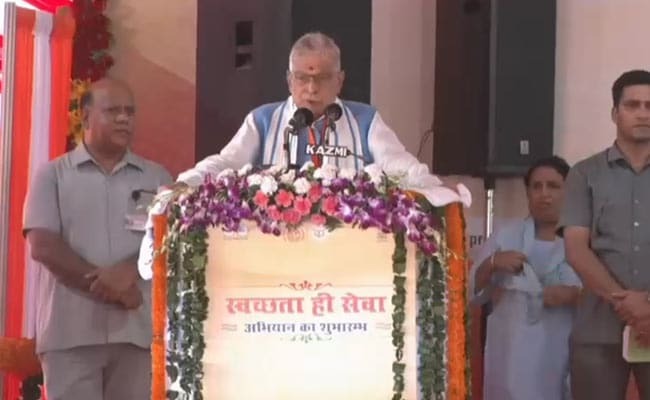 Murli Manohar Joshi, Member of Parliament from Kanpur said that India's image has become that of a country which is unclean and open defecation is rampant. It is surprising that India. 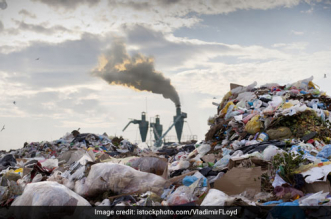 which was one of the world's cleanest countries has become one of the most unclean ones. He says that it is most unfortunate that Kanpur is biggest polluter of the river Ganga. Without the cleaning of Ganga, attaining a clean India would not be possible. Two of the world's dying rivers hail from India. Both India's and Ganga's cleanliness are related and cleaning them must be undertaken together. Anurag Thakur, BJP MP from Himachal Pradesh participated in the ''Swachhata Hi Seva'' campaign by conducting a cleanliness drive. Ms Bharti says that a clean India is important for the country to make a mark in the global map. Both responsibilities and rights are part of India's cleanliness initiative. She says that everyone must be a part of this campaign. 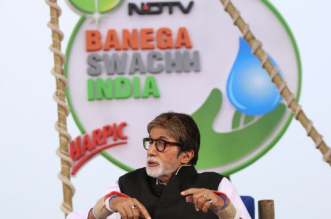 If 125 crore Indians pledge to cleanliness, there is no way the country would remain unclean. 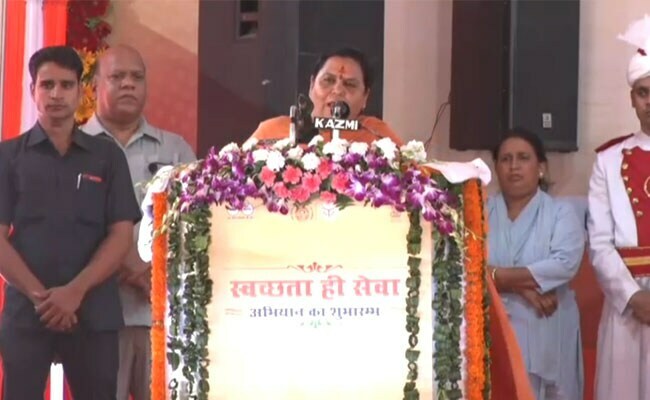 Uma Bharti, Union Minister for Drinking Water and Sanitation says that she feels blessed to be a part of such a programme post her taking over the Ministry. She says that people through their activities will play the major role in ensuring cleanliness and the role of governments is limited. She says that India has to become open defecation free by October 2019 and Uttar Pradesh will have to attain the ODF status by 2018. 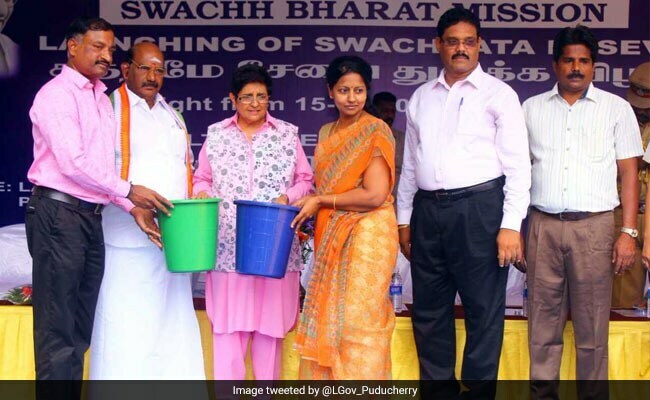 Kiran Bedi, Lieutenant Governor of Puducherry, gave away tumblers to promote the habit of waste segregation during the launch of the Swachhata Hi Seva campaign. The municipal corporation of Puducherry also launched an app during the occasion. Parameswaran Iyer, Secretary, Ministry of Drinking Water and Sanitation, addresses the dignitaries present at the launch. Mr Iyer says that the Ministry has made grand arrangements for the campaign. 25 crore people have benefited from the Swachh Bharat Abhiyan. Over 2,38,000 villages, 155 districts, 1300 cities and 5 states have become open defecation free. 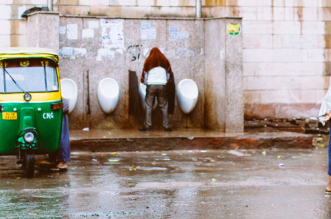 10 states are on the verge of becoming open defecation free. Uttar Pradesh Chief Minister Yogi Adityanath welcomed President Ram Nath Kovind with a bouquet of flowers. Union Minister for Drinking Water and Sanitation Uma Bharti is also present at the launch. 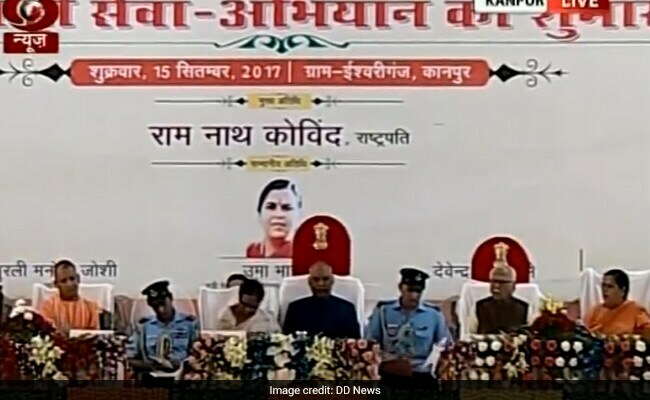 President Ram Nath Kovind arrives at Kanpur to launch the Swachhata Hi Seva campaign. Indo-Tibetan Border Police officials, on the occasion of the launch of the Swachhata Hi Seva campaign, launched a theme song and took a Swachh oath to maintain cleanliness. Home Minister Rajnath Singh pledged that he will dedicate two hours every week towards volunteer work to ensure cleanliness in his surroundings. Mr Singh also pledged that he will not pollute his surroundings and maintain cleanliness in his home and workplace. 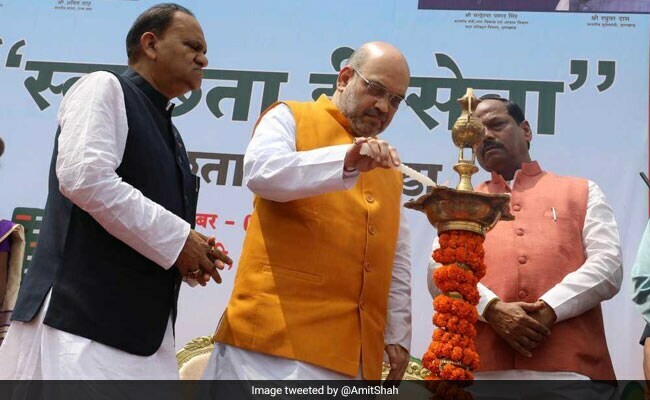 BJP President and Rajya Sabha MP Amit Shah launched the Swachhata Hi Seva campaign from Ranchi, Jharkhand and took an oath to maintain cleanliness. Madhya Pradesh Chief Minister Shivraj Singh Chouhan flagged off the Swachhta Rath and invited residents of the state to make the campaign a success. 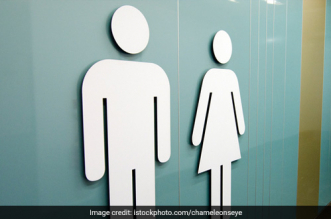 Home Minister Rajnath Singh, who participated in a cleanliness drive with ITPB officials in Delhi, stated that the government is confident in fulfilling the Prime Minister's vision of making India open defecation free by October 2019. The campaign, which marks the third anniversary of the Swachh Bharat Abhiyan, will see large scale mobilisation of several dignitaries who will engage in volunteer work or 'Shramdaan' related to construction of toilets to make surroundings open defecation free. The campaign will also witness cleaning up of public and tourist spaces. Maharashtra Chief Minister Devendra Fadnavis participated in a cleanliness drive at Crawford Market to mark the launch of the campaign. The Swachhata Hi Seva campaign, coordinated by the Ministry of Drinking Water and Sanitation and launched on September 15 will see mobilisation of several dignitaries such as the Prime Minister, Chief Ministers of State, Members of Parliament and NGOs.